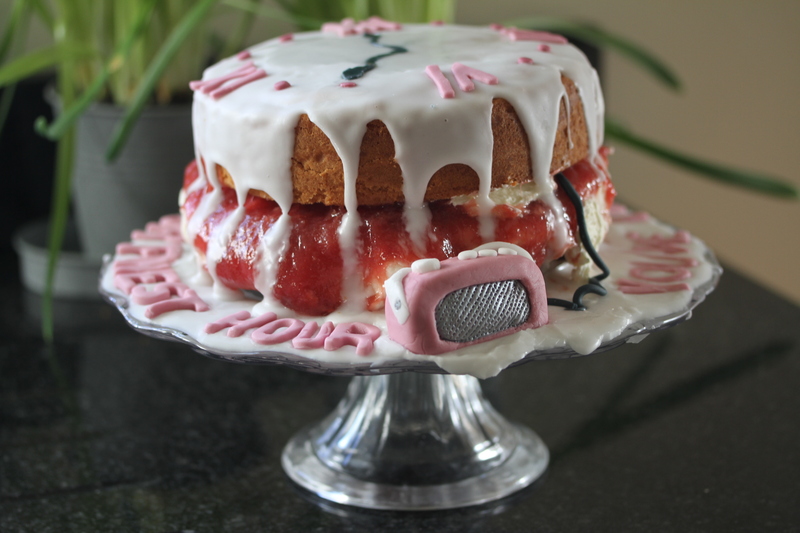 My bake this week was a cake that I entered into Radio Chepstow’s cake competition and the theme was Radio Ga Ga, by queen. I tried very hard and it took nearly two weeks of practise and putting it altogether but I got there. I wanted to bake a cake that tasted yummy and wasn’t lost in sugar paste. 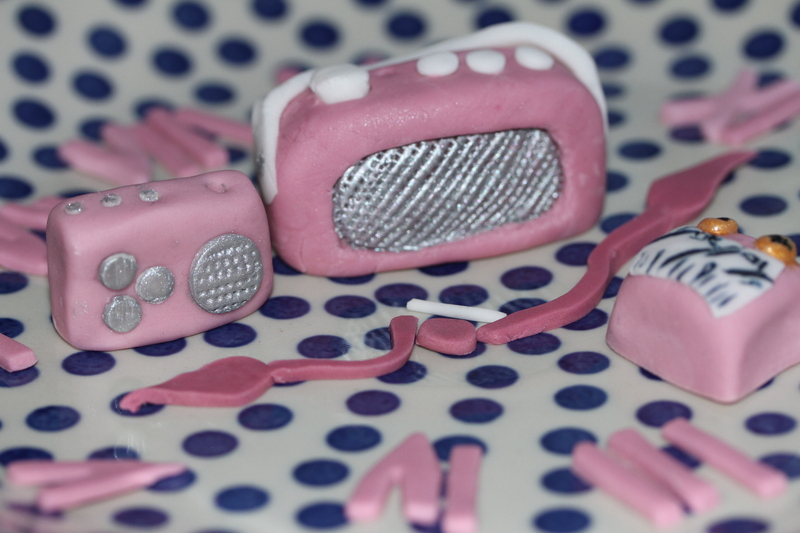 I did use a bit of sugar paste which was a new experience and it took a lot of work getting use to something new. My cake was made up of a victoria sponge filled with my home made rhubarb jam and a rose butter icing. The top of the sponge was then covered in a drizzle of glace icing. 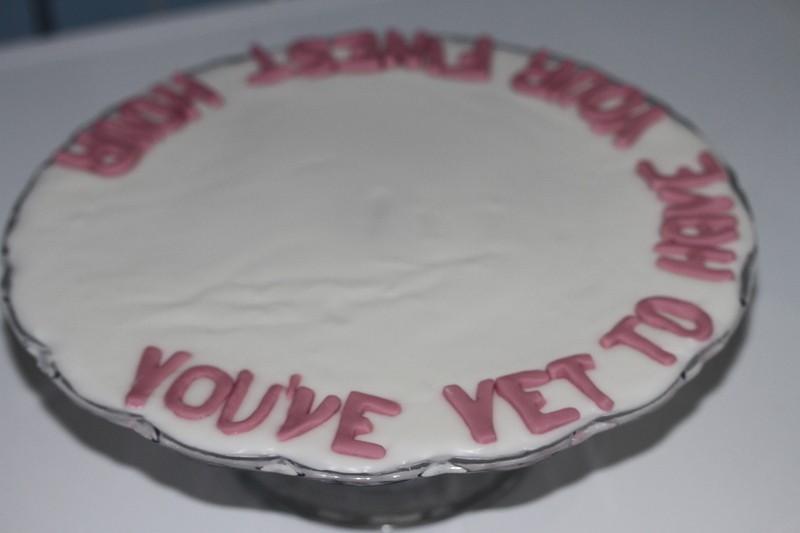 I then cut out numbers and clock hands from sugar paste and made a clock face on the top of the icing then at the side of the cake I put in sugar paste the words “you’ve yet to have your finest hour” and I also made a pink sugar paste radio. with a wiggly wire that plugged into the cake. I made as much as I could the nights before like the sponge and the letters but I then had to wake up at 5.00 the morning of the competition to put the cake together. When we got in the car and was about half way to Chepstow, (which was where the competition was) Mami braked a bit hard and my cake slid away, and the filling was every where. It was a shambles, it looked horrible. All the cakes were put onto Facebook and the winners were those with the most likes and surprise surprise I came joint first winning Mary Berry’s Cooks Book. I just wanted to say thanks for everybody who liked my photo and i could not do it without your likes! 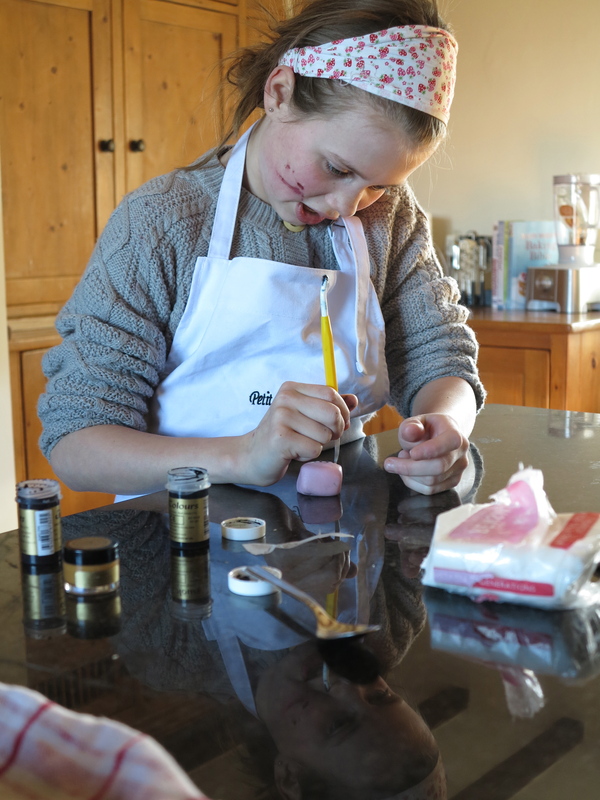 And also thank you Chepstow Radio and Sophie Bensley (Cooks Galley) for all your help with my sugar paste advice and supplies. This week I’ve done an easy bake because I’ve been busy practising making and decorating a cake for a competition that I’m entering this weekend. So I’ve gone for Key Lime Pie. It’s a bit similar to a cheesecake and is made from condensed milk, lime juice and cream with a biscuit base. It’s an easy pudding to make and everybody likes it. 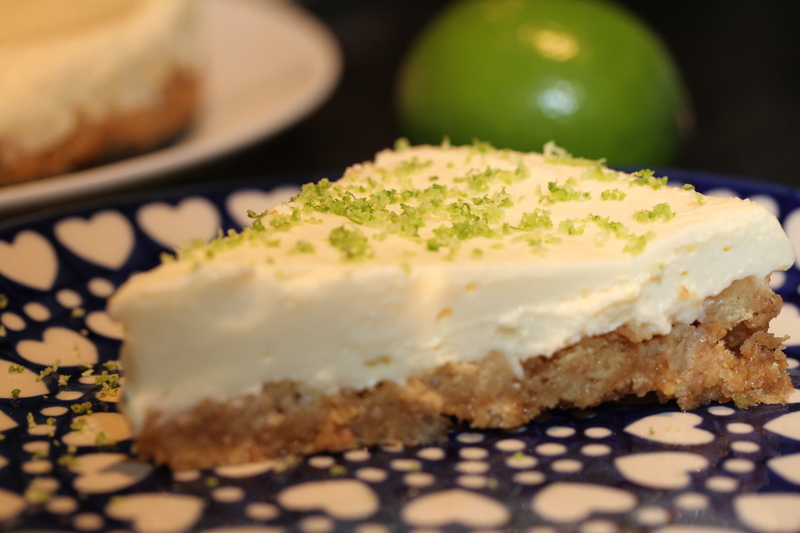 Did you know – The first Key Lime Pie was made in the 1850’s. Because there were not many cows on the Florida Keys the residents would use sweetened condensed milk and it seemed a great idea to mix this with the limes that grew in the Keys. In 2006 Key Lime pie was adopted in the state of Florida as the official pie. I love pancakes so my bake this week had to be pancakes with my favourite topping Nutella and when I’ve had too much Nutella I then have them with sugar and a little bit of lemon. Pancake mixture is a batter that is also used for Yorkshire pudding. It is made from flour, eggs and milk. The mixture is poured into a small frying pan and cooked for about half a minute and then you toss the pancake and gently cook the other side. Pancake day is on Shrove Tuesday and is known as pancake day. 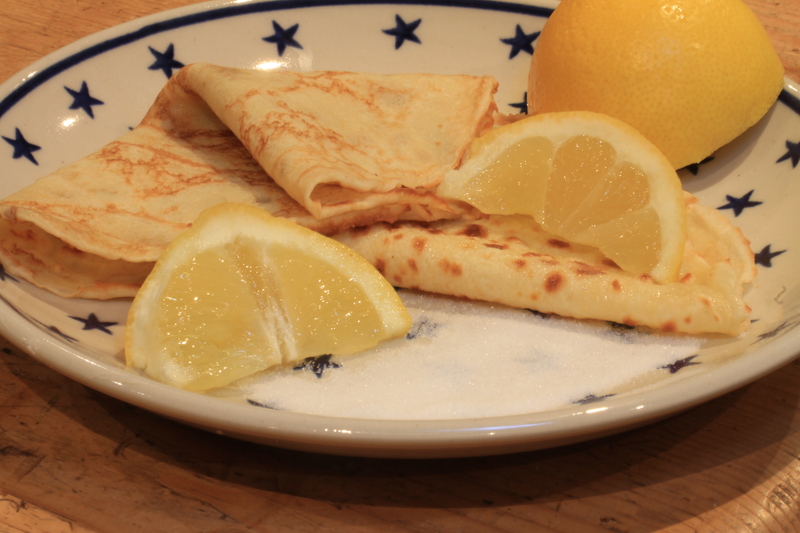 Pancake day was done because you had to try and use up your ingredients before lent began. Lent is when you give up something. and Shrove Tuesday is the last chance to enjoy yourself, and for you to use up foods that aren’t allowed in Lent like butter and eggs which are some of the ingredients in pancakes. The word Shrove comes from the word Shrive which means confess. on shrove tuesday in the middle ages, people used to confess their sins so that they were forgiven before the season of lent began. On pancake day Britain will use 52 million eggs but on a normal day they will eat 30 million – thats a lot of eggs. 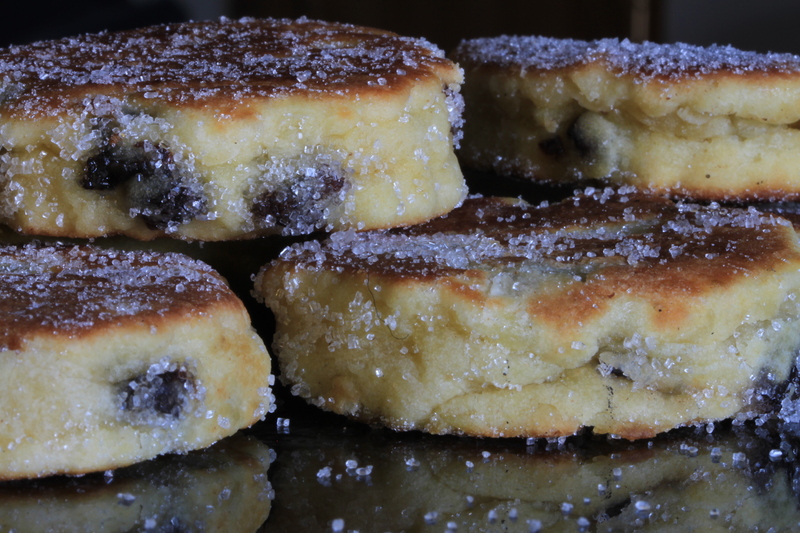 This week my bake was welsh cakes also known in Wales as Pice ar y Maen which means means cakes on the stone. I did this bake because it was Saint Davids day and I thought I would do a welsh bake! I found this bake quite easy but I did struggle on baking them but I know now next time to turn my temperature down so that the bottom does not bake so quickly and it gives the middle a chance to bake and not stay like a biscuit dough. The Welsh cakes dough is a biscuit dough but also like a scone mix. The baking of welsh cakes began in farmhouse kitchen to go with a cup of tea. They would baked in small batches on a bake stone over the fire. Once they were baked they would taken the Welsh to the local farm shops for people to try. Everybody loved them. Older recipes would use half lard and half butter but today we just use butter.